Here are 35 photographs of Meriden's past. I have lived there all my life and remember the way Meriden once was. These photos were taken way before my time, but I still enjoy them and hope you will too. 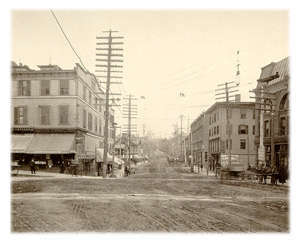 Meriden was first incorporated as a town in May of 1806 and then as a city in June of 1867. In an effort to improve this new city, many houses, churches, and schools were built. Many of these sites in the below photos are no longer there. 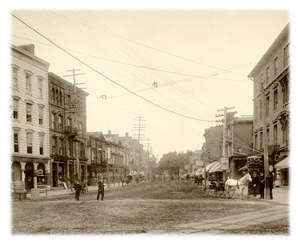 This is a view of Broad Street looking south from the corner of East Main Street. The building with the Ionic columns was the Squire Eli Birdsey's house, which is now an lot with a flag pole. The church was erected in 1830. 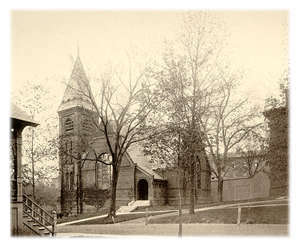 When a second Congregational Church was established on Colony Street, this one took on the name Center Congregational Church. The steeple is a Christopher Wren original. At the corner of Crown Street and East Main Street. This building was erected and dedicated in 1868. It has undergone numerous renovations. In the mid 1950's the CT Bank & Trust Company built a branch in front of the church. 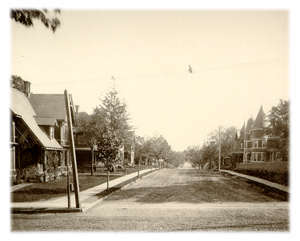 This is a scene of Curtis Street looking north from the intersection of Curtis Street and Ann Street. 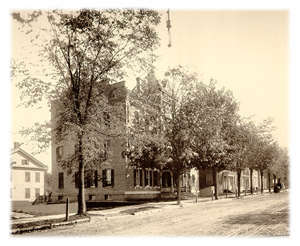 This is the original Meriden town hall built in the early 1860's which burned down in 1904. Abraham Lincoln spoke from these steps while campaigning for the presidency. 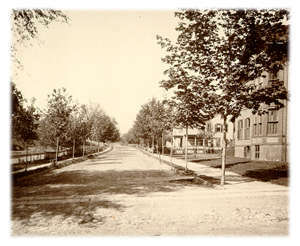 This is a picture of Cook Avenue looking south from West Main Street. This house was once A.W. Curtis's house. 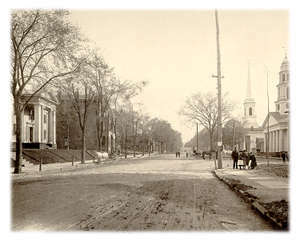 This is a view of East Main Street looking east up the hill toward the Town Hall. 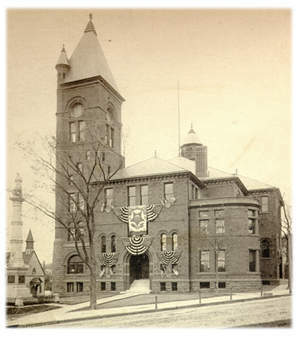 The Central Grammar School was located between Liberty and Miller Street and was the former German-American School. 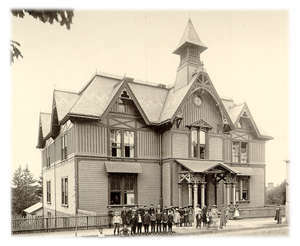 The building was sold to the school district in 1903. This a scene of Linsley Avenue looking south. 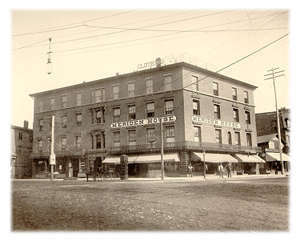 This building was once a hotel located on the corner of Colony and East Main Street. 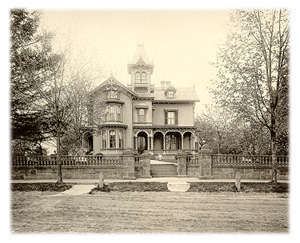 This house was built in 1869, but burned down in 1934. This site is now the Miller Memorial, a home for the aged. 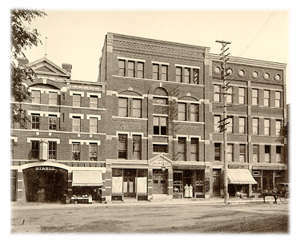 The building was used as a meeting place for the International Order of Odd Fellows. 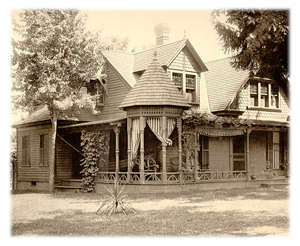 This was the home of Orville Hitcock Platt, one of only two U.S. Senators from Meriden. This house is now Girls Incorporated. This school house was built in 1873 and was originally called the North End School. 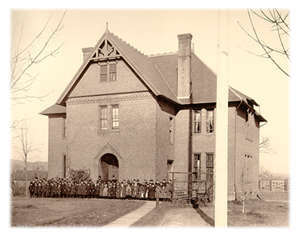 Later the name was changed to the Prattsville School. 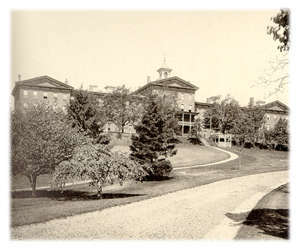 Once used as the Connecticut State Reform School for Boys, the building is now used as the State Police Special Services & Forsenic Laboratory Complex. The first service held in this church was in the basement in 1881. 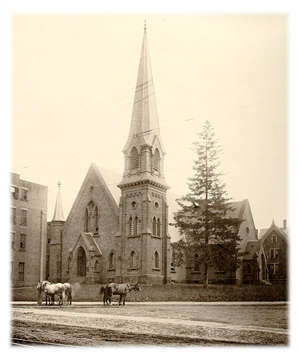 The rest of the church was finished and dedicated in 1888. 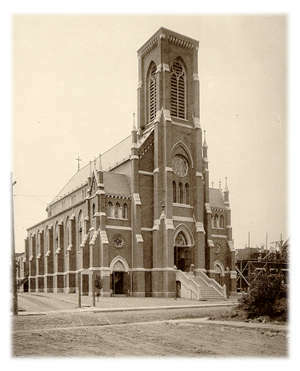 It was organized to minister to the needs of the many French-Canadian and German Catholics who had worshipped at the Saint Rose Church. The Parochial school behind the church closed a few years ago and was recently demolished. 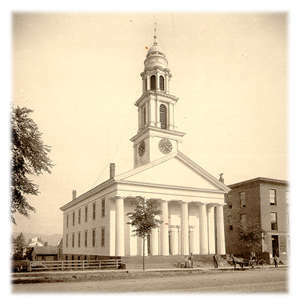 Saint Rose patrons worshipped in a building on Broad Street until this church on Center Street was finished in 1856. The present edifice was formally consecrated in 1926. The Meriden Young Men's Christian Association dates back to the winter of 1866. 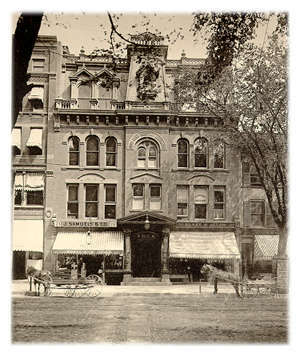 This building was finished, furnished, and dedicated in 1877. By 1889, it was considered the best equipped gymnasium in the city. The Y.M.C.A is now located on W. Main St. and was built in the 1990's. Prior to that the former Y.M.C.A. was located in the same place and had dormatory rooms above the gym,exercise rooms and pool. The N.L. 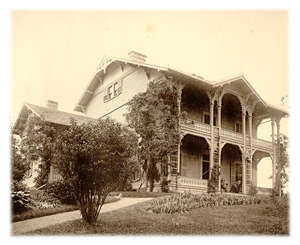 Bradley house was bequeathed by Clarence P. Bradley to be made into the Bradley Home for the aged in 1935. 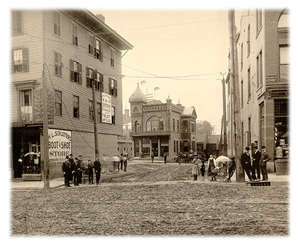 This lodge was located on Broad Street between East Main and Libery Street. This is a view of Colony Street looking north at the intersection of East Main Street. 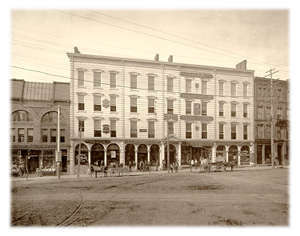 The building on the corner was the Meriden House, a local hotel. 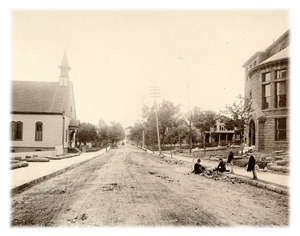 This is a picture of Cottage Street looking north from the East Main Street intersection. Original this was the home of Samuel J. Curtis, a philanthropist and warden of the St. Andrew's Episcopal school for many years. 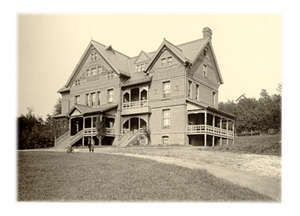 The Curtis Home was dedicated in June of 1884 for the sole use of as a residency for the elderly. Also known as Rushford Childrens Services. 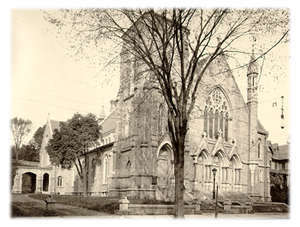 After years of construction the church was completed and dedicated in 1879. 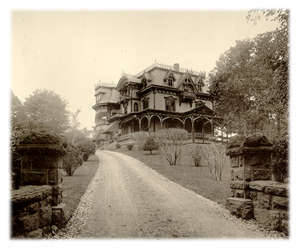 It was renovated again in the 1950's when the portico on the south side was removed. There were plans to erect a steeple on the southeast corner of the church, but it was never built.. 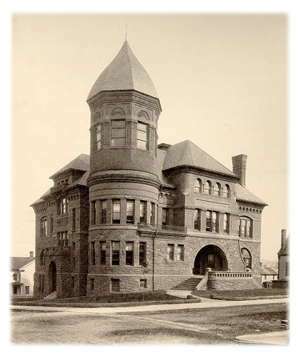 The building was built in 1885 and was used as the Meriden High School. 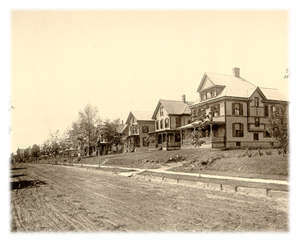 Later it was used as an annex when a new Meriden High School was built on Pleasant Street. Currently this building is occupied by the Meriden Board of Education. 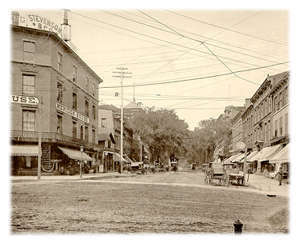 This is a view of Liberty Street looking east near the intersection of East Main Street. 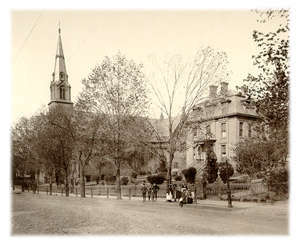 The church on the left is now the Christain Pentecostal Church. This Methodist Church is located on the corner of East Main Street and Pleasant Street. 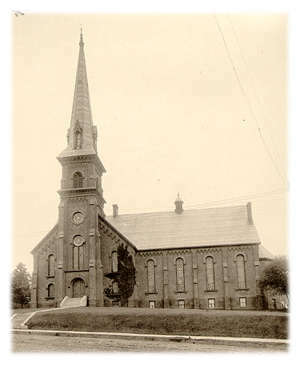 The church was built in 1867 and later rebuilt after a fire destroyed the structure in 1941. This building was destroyed by fire in the 1950's. The Castle Bank & Trust Company and parking lot now occupy this site. 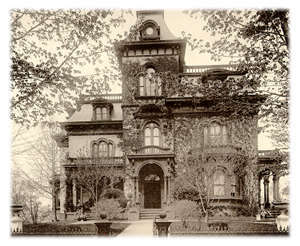 This is the home of Charles Parker, the first mayor of Meriden and the founder of the Charles Parker Company. This is a picture of South Colony Street looking south from East Main Street. 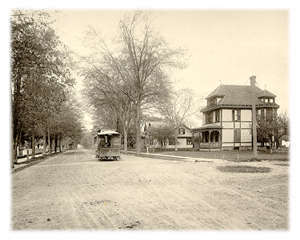 Notice that it shows how South Colony Street once was connected straight through to East Main Street. This is photo of another part of the State Police Special Services Complex and Forensics Labratory. Once used as the Connecticut State Reform School Chapel. 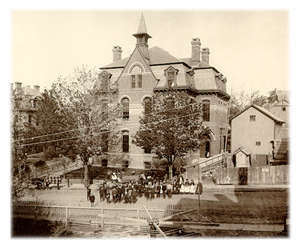 This is the St. Rose School, established in 1883 and used by the children of St. Rose Church parish. This building was torn down recently. This is a view of West Main Street looking west from the intersection of Colony Street. 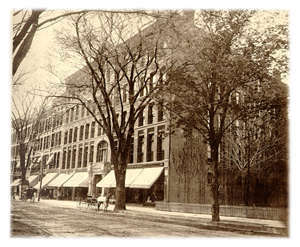 Originally this building was used as a hotel with the Ives, Upham & Rand Department Store occupying the first floor. (C) 2004 by N1LEU & Silver City Software. All Rights Reserved Worldwide.